These past few weeks have been filled with lots of exploration, and so much excitement! Adjusting to The Netherlands culture has been very interesting, as we have done many things to experience it. 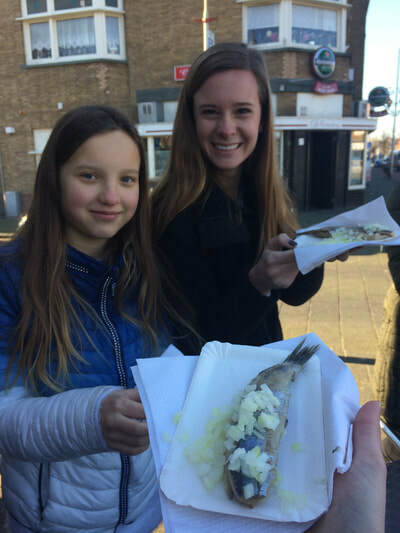 During Paige and I’s first week at De Helderlandschool, our Groep 7 class and us walked around the town and made our way to a fish stand. It was here, that Paige and I tried a bite of raw herring. This is a common food eaten here, but not by all. 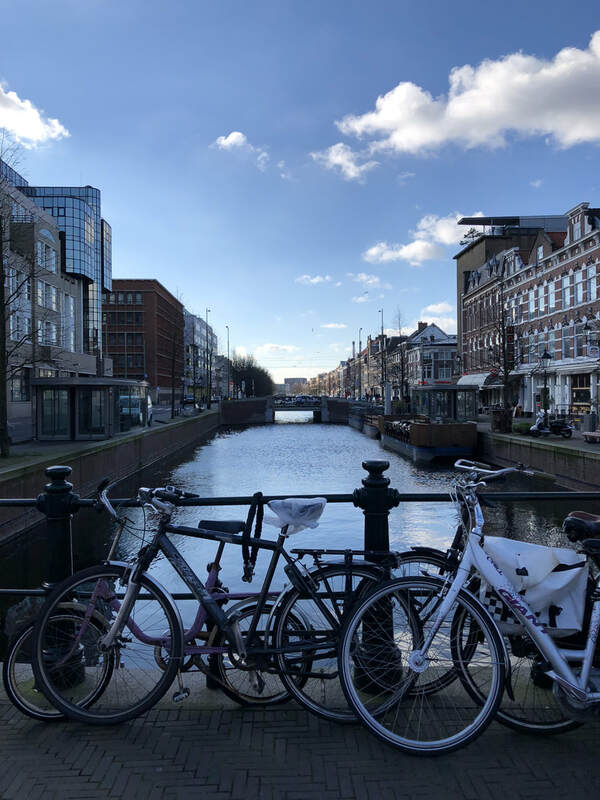 It was not necessarily our favorite meal that we have tried in The Netherlands, but it definitely was one to remember! The following week at school was a bit more adventurous. Groep 7 has been preparing for their bike license exam that they will take in April. 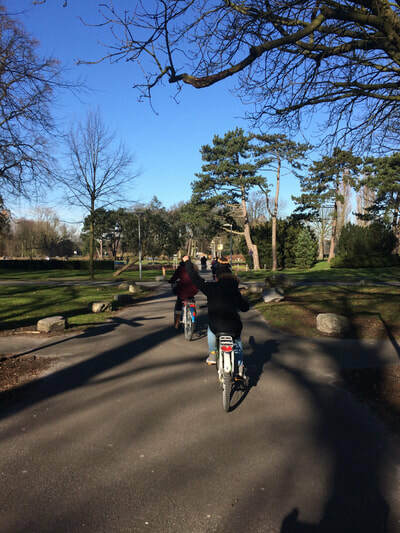 Our teaching found that us being there was a great opportunity to take the students out for a bike ride to Zuiderpark! The students were all so excited to go out and really practice the biking rules and regulations that they have been learning about. We biked to the park close by school. Going around the park, as well as the town. It was interesting to see how much freedom the students were allowed to have outside of the classroom setting. 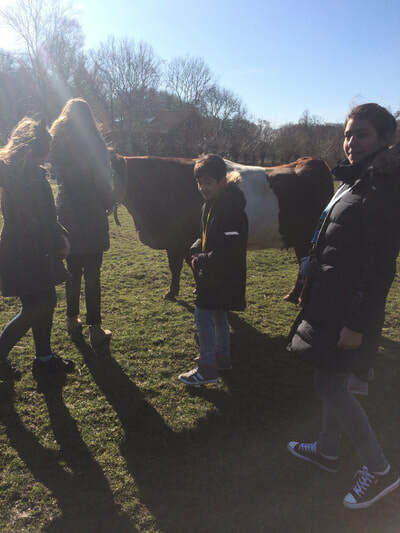 As we made our way back to the school, we stopped by a petting zoo that was located in the park. We saw cows, goats, chickens, guinea pigs, and a rabbit. The students were excited to see the animals, and they were brave when it came to touching them. Those two events were things that you would not necessarily see back in the United States. 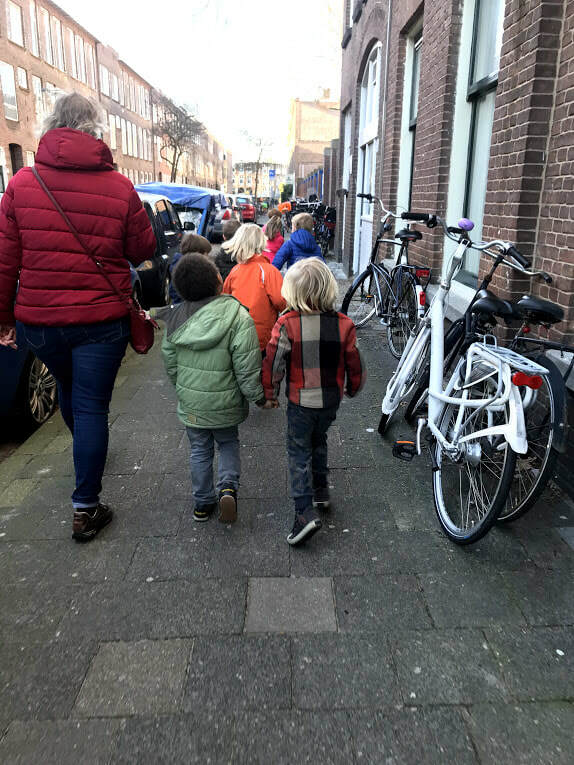 The students were given so much trust when it came to them biking around town. With only the teacher leading the way, and Paige and I in the back of the line making sure the students were all there, the students really took the bike ride seriously, and took all of the proper precautions and followed the rules. It has been an exciting time so far and we are sad that it is coming to and end! 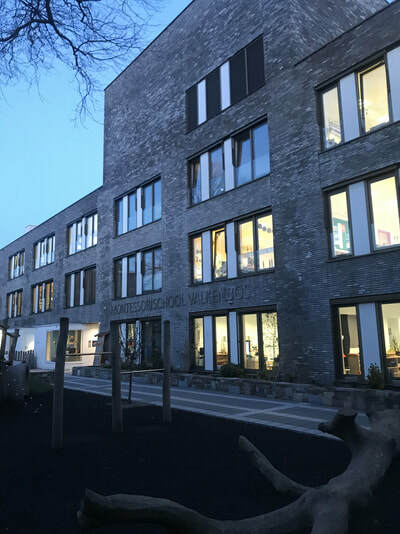 For the past two weeks, Katie and I have been spending our weekdays at The Gelderlandschool. This school is an immigrant school; students come from varying countries and cultures to The Hague and this is one of the schools they may attend. 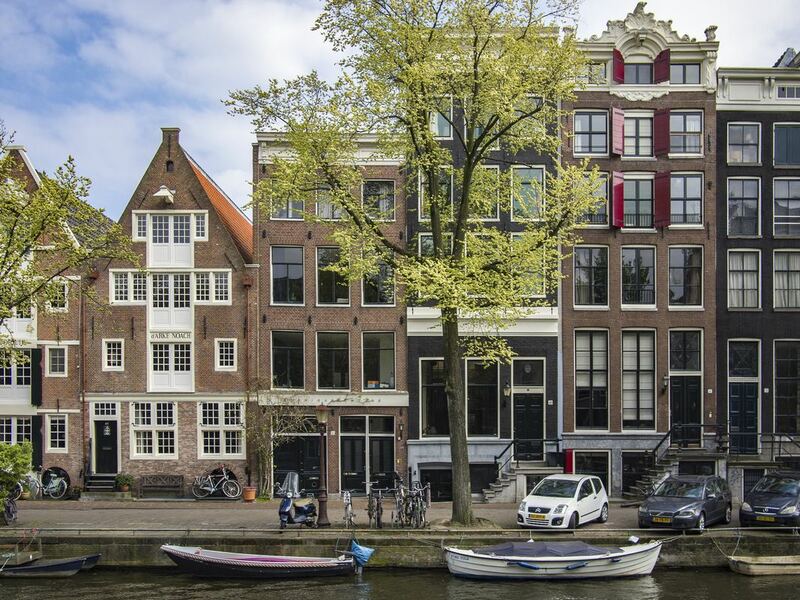 Time spent in The Netherlands varies from student to student. 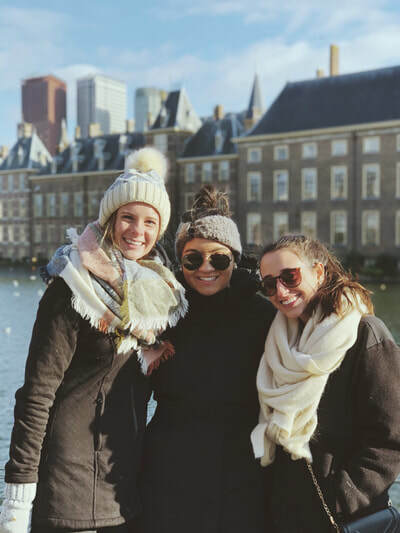 Some students have been in The Hague and speaking Dutch for most of their lives, while others have immigrated in the past year. 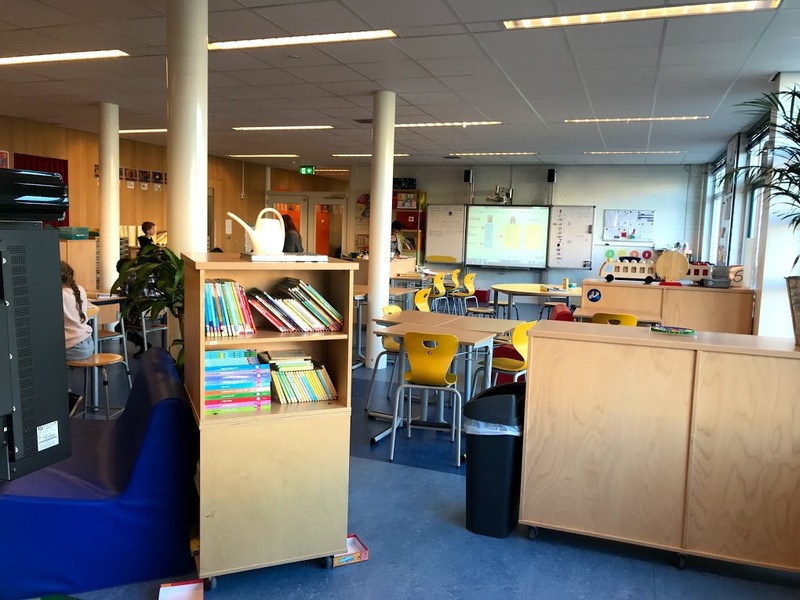 This past Friday I had the opportunity to visit a special education school here in The Hague. Special education is a little different here. From what we have seen there is rarely a special education room in the general education schools. 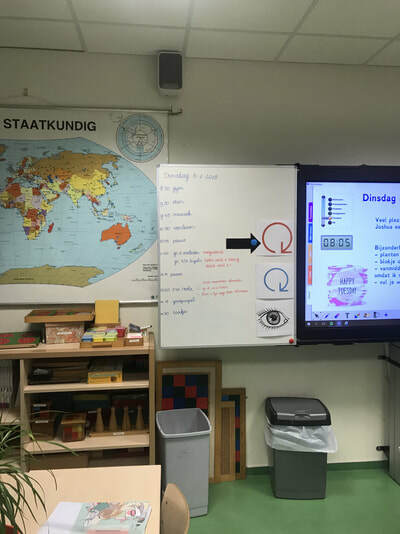 Students typically function at the same levels as there peers and in Montessorischool Valkenbos there is one student with a slight hearing impairment and the teacher accommodates for this by using a microphone system paired with his hearing. That is the biggest extent we have seen for special education. Students in wheelchairs or physical impairments go to sectioned schools and students with intellectual and developmental schools go to their own schools as well. 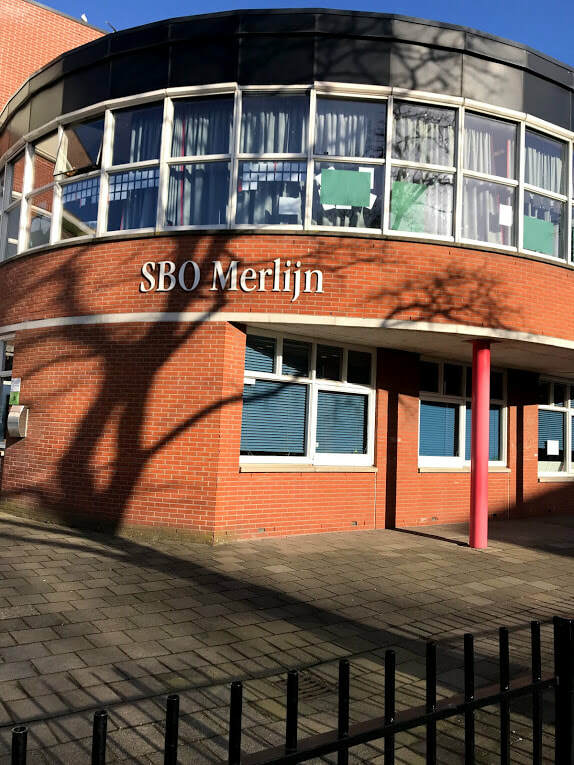 SBO Merlijn is the school that Erin and I visited. 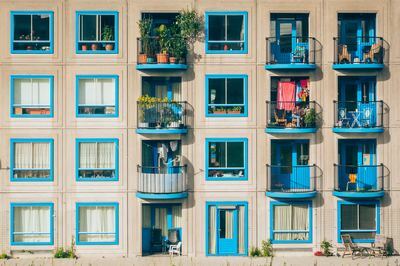 From what we could tell and were told, it is for students that don't have a severe diagnosis but also are not able to excel in the general education classroom. This could be due to inappropriate behavior or learning disabilities. 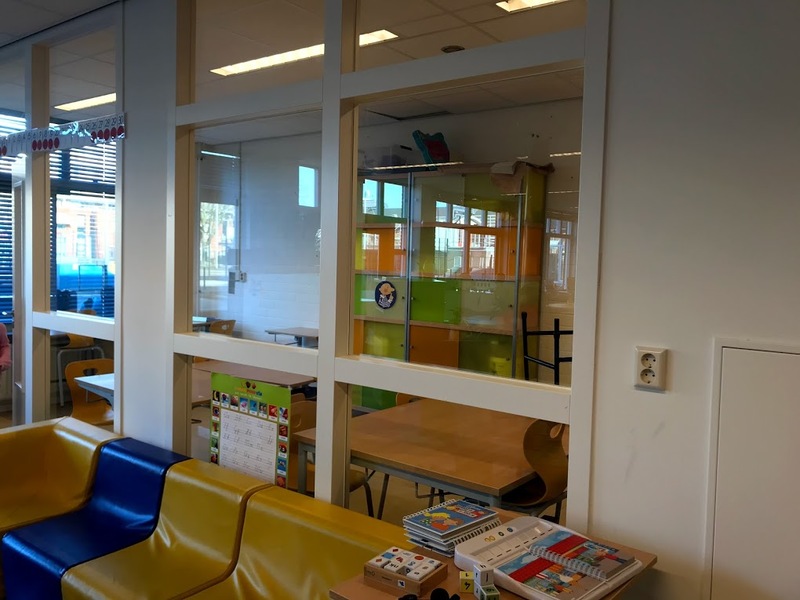 Walking around the school it is colorful with big windows and the clear doors we have seen in other schools. They also have combined the two classrooms in each grade to create a large workspace for students to work together with two teachers co teaching. 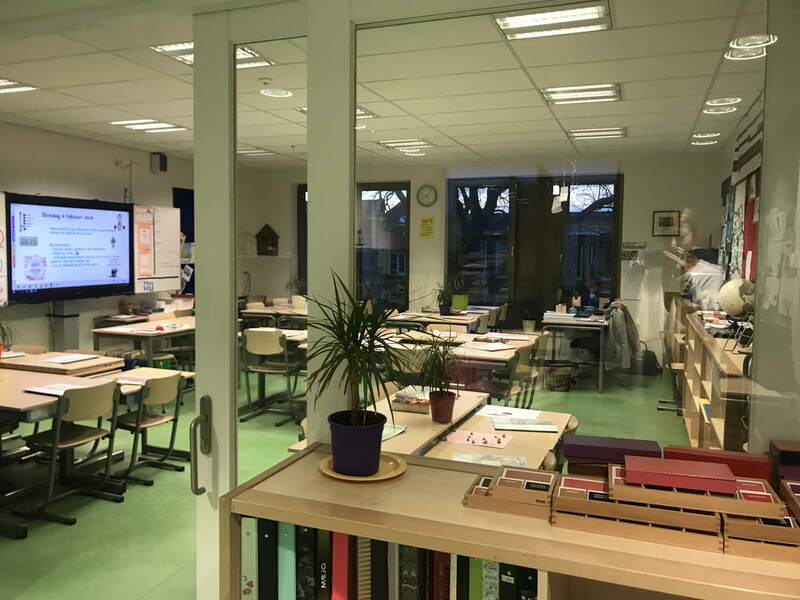 The two classrooms being brought together has allowed the school to create different learning spaces around the classroom including a smaller room with windows that is sound proofed for silent work time. 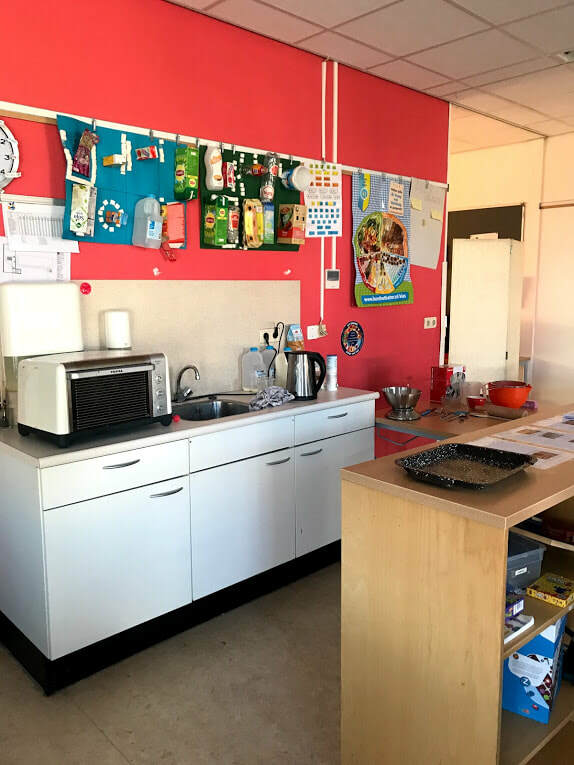 There are also kitchens in each classroom for students to practice following recipes and create science experiments! The school also has clear visual schedules on the board for students to follow during the day, similar to special education classrooms in the United States. The students also use visual "maps" that describe what they need to complete during that given day or week. Some examples are displayed below. 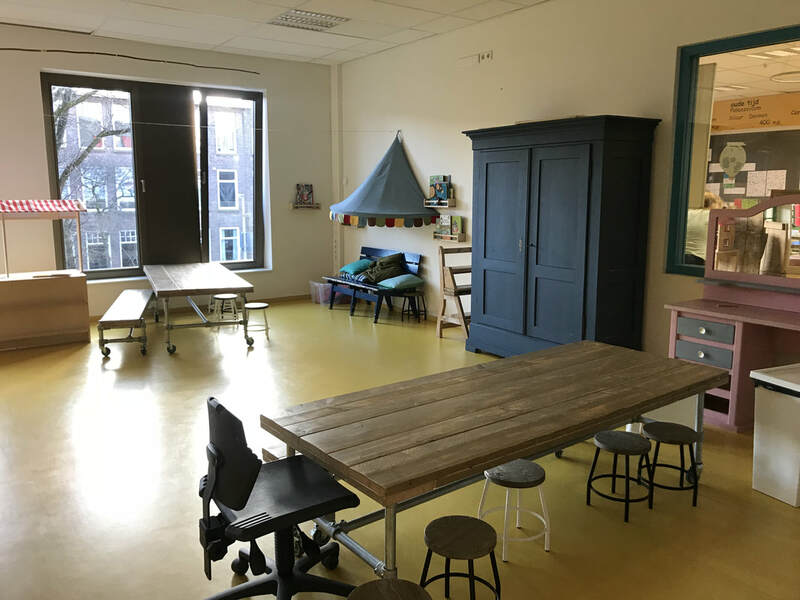 It is interesting to see such a successful school system such as the one in The Netherlands that looks at Special Education so differently. I feel as though we push and value inclusion back in my classroom in Texas and the United States as a whole. Yet here students are more strictly separated based on their academic level. I am curious to research more into what the benefits are to this separated system. One thing is for sure, I wish our special education classrooms were as beautiful and spacious as these in this school! We have completed our second week here and are sad that the time is slipping away so quickly. This weekend we leave The Hague with all our stuff to head out on our travel week; we will be visiting Switzerland, Italy, and France! This past week we had such a great time getting a deeper understanding of the school system here as we spent Thursday visiting each others schools. 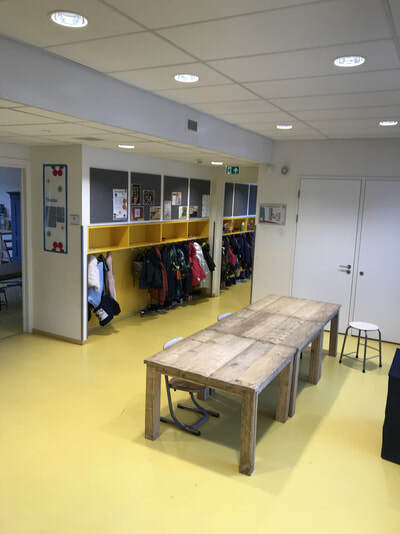 We were able to see some commonalities throughout such as work spaces in the hallways and increased responsibilities given to children. Sarah and I were also able to go with the OB classroom (ages 4-6) on their trip to the library. The teacher and a parent chaperone gather the students together and they each hold hands with a partner. We then set out to walk about three blocks to the local library. It was so fun to walk with the students around the library as they chose the book they wanted to check out. 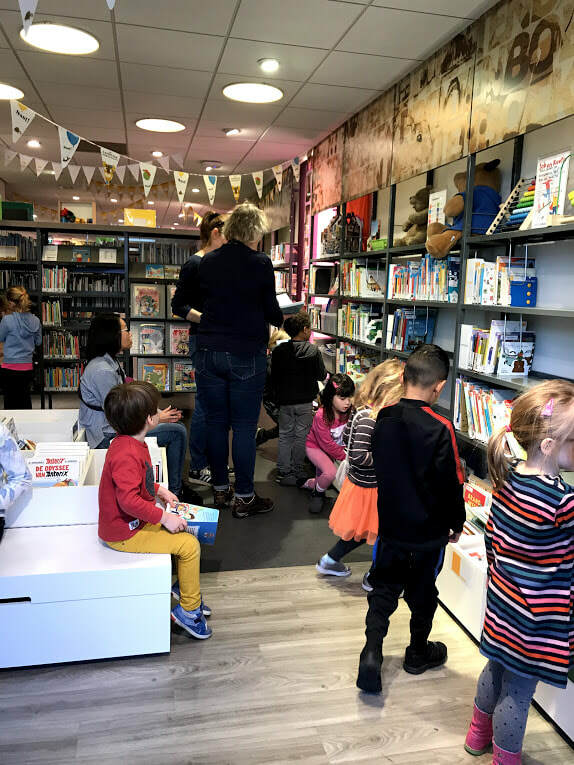 We loved that the school has the opportunity and ease to simply walk down the main street to their local library as their school library is limited to a small portion of one of the hallways. We also spent time with the OB class doing a science activity. I was amazed at how seamless it went considering there was black paint and lots of little ones running around. 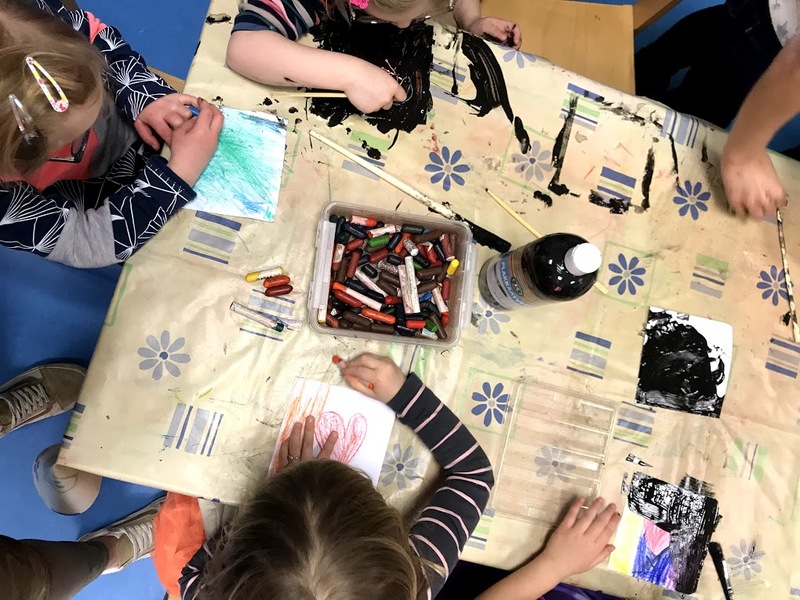 The teacher set up one of the tables with a table cloth, the black paint, crayons, and paintbrushes. Students would come in groups of around 4/5 and color the paper then paint over it with black paint. It was amazing there was hardly any black paint on the floor or on any of the clothes! Afterwards students were able to carve little stars or moons on the black "night sky". During this activity there were two students from our BB classroom of the older students that helped the whole day. This was due to the fact that our teacher was out for the day and since they weren't able to find any substitutes, they split all the students in that class into different classrooms throughout the rest of the school. 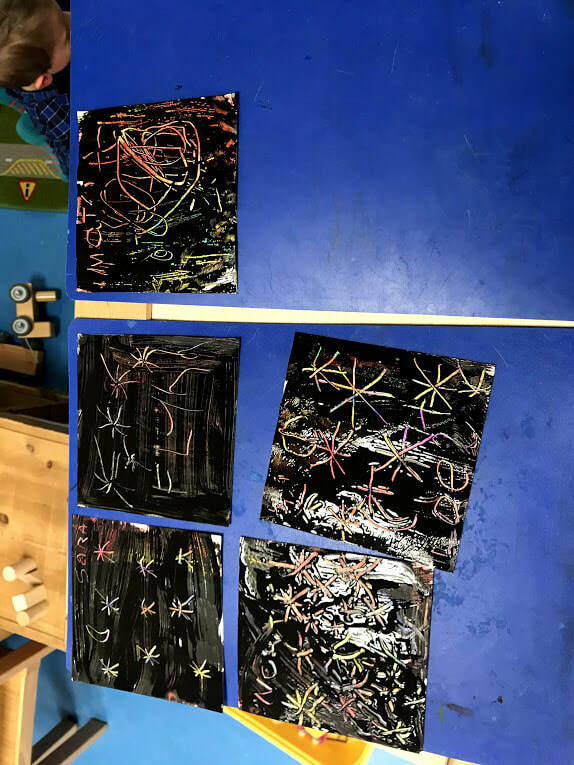 I was a little surprised to see such older kids spend their whole day with the little ones but they had time to work on their independent projects they also enjoyed from the social interactions of helping/teaching/playing with the younger students. It made the school culture feels familial of a family! We are sad that this is our last week at Montessorischool Valkenbos and are savoring every last second we have had! Thank you so much to the teachers, administration, The Hague University faculty, and TCU College of Education for planning such an enriching experience for us! We are missing all of you TCU friends and wish you were here to experience everything. This week has been incredible and I cannot believe that I get to experience this. We are having the time of our life here while learning so much. 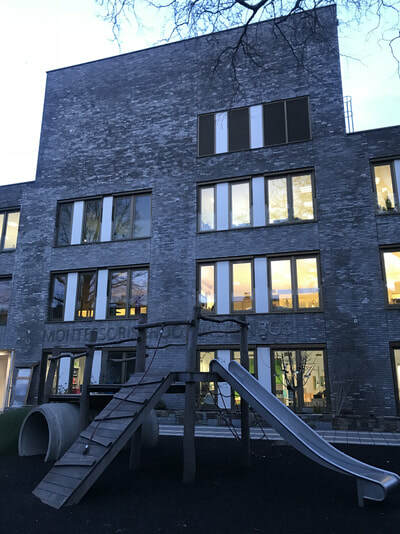 Hannah and I are at the Valkenbos Montessori school in The Hague, Netherlands. It is about 3.5 miles from our condo. We quickly learned the first day that we needed to rent a bike. Now we are biking about 10 miles each day. 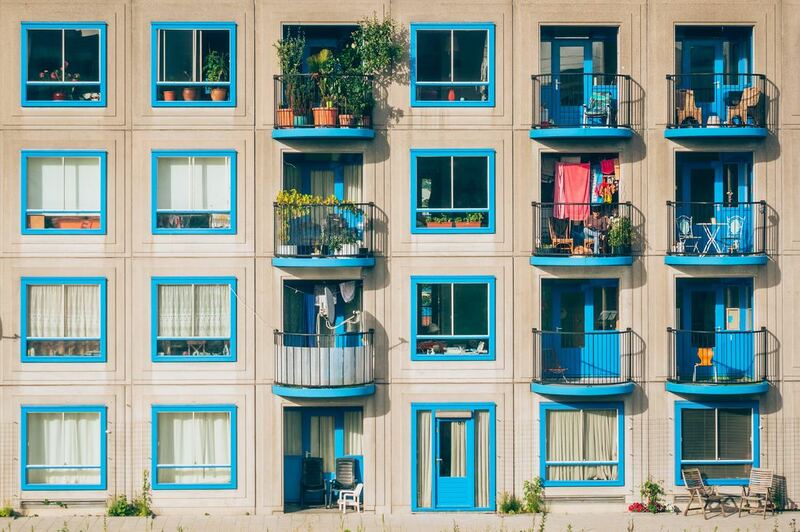 The Dutch lifestyle is quite healthy! Hannah and I are in love with the Valkenbos Montessori. Mr. Erik is the teacher who invited us TCU students to teach at Valkenbos. He has been quite helpful during our stay, while teaching us about the Dutch culture and education system. Mr. Erik hosted Hannah and I at his house for a Dutch dish that his wife cooked for us. His wife and him also took Hannah and I on a tour of The Hague Saturday afternoon. They have been incredibly hospitable to us and we are thankful for them. Mr. Erik teaches groups 6,7,8. 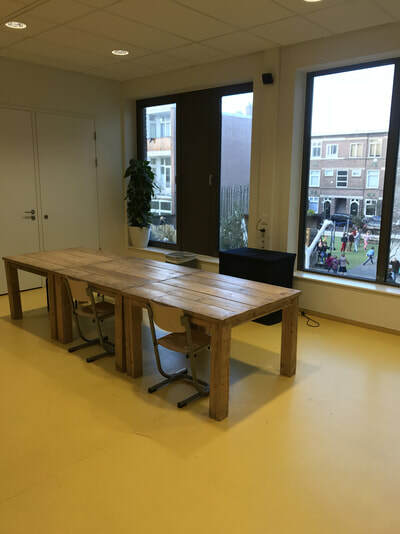 Students start at Valkenbos at age 4 (Group 1) and stay until age 12 (Group 8). There is the OB group which is groups 1-2, MB group 3-5, and BB group 6-8. The students, teachers and staff at Valkenbos are welcoming and have engaged us in the education process at the school. We are lucky to be able to experience all groups. Mr. Erik had the teachers sign up for Hannah and I to be in their classrooms each day. We feel like we know the whole school in 1 short week! We are very excited because we get to go on our first field trip this Thursday to the Space Museum. Hannah and I are eager to get back to the United States and start implementing some of the teaching techniques in to our Fort Worth schools. We are amazed at how motivated, advanced, and determined the teachers and students are. My favorite part of this trip is getting to watch the self- motivated students work hard at such a young age. The teachers guide the students, but all the students make their own learning plan for the week. The students decide what, when, and how they are going to learn that week based off of the teacher's choices.Hannah's favorite part is watching the interaction between teachers and students. It has been great to watch the teachers motivate the students to learn in an authentic way. The Valkenbos students do not learn English until group 7. 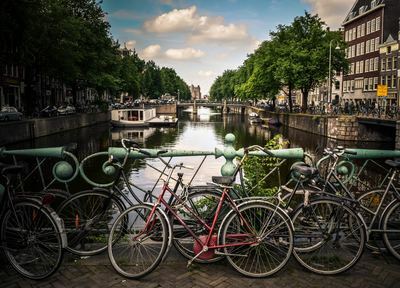 Most students only know Dutch, while a handful know English from their parents or TV shows. We are getting to practice a lot of ESL strategies that I learned in Dr. Pryzmus' course. We are able to still teach some english lessons to small groups. We have been playing a game where the students receive a sticky- note that has the name of an object around the room. The students then have to place the sticky note on the correct object around the class. We try to incorporate english through out the day while also learning a lot of new Dutch words thanks to the students. We are loving our time here in The Hague. We are so fortunate to be at the Valkenbos school with such great teachers who are able to teach us so much. I cannot believe it has only been one week, yet we have learned so much. We look forward to the next few weeks.